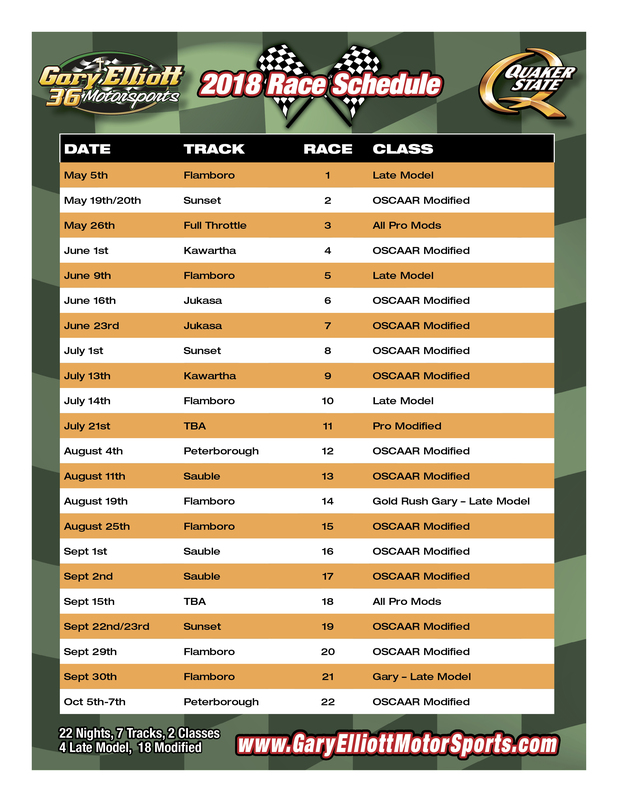 Cayuga Speedway introduced a new stock car division called Mini Stocks. I wanted badly to race and this seemed to be the perfect opportunity. I was living at Nonies place at the time. We weren’t married yet. We basically built this car in their back yard. Mr. and Mrs. Bow were very gracious and put up with a lot. This however would be just the start of me agravating a lot of people in the west end of Toronto. 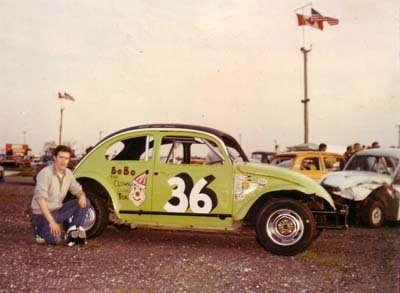 Nonie and I went to Merrittville Speedway to run on the dirt in the Mini Stock class. 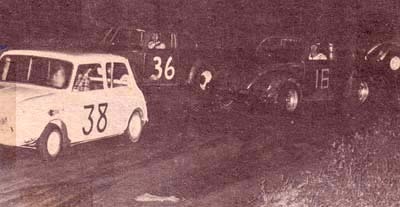 Here is Harry Cooper #38 driving a Mini and Larry Benjamin #16. They both ran very competitive. It didn’t take us long to want to race only at Cayuga or other paved tracks. 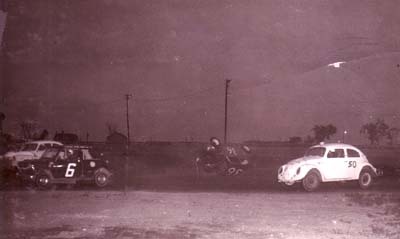 Here we are on the back chute at Cayuga racing against #47 Doug Sutton and #5 Art Bird. These guys were good runners also. I struggled quite a bit in the Mini Stock class. We ran on less than a shoe string but wanted to be there every week. The people were great and we had fun. Seems that would be the formula for ever…in the feature I tried going in real hard into turn one. The car pushed so bad that I clipped a guard rail and flipped over. 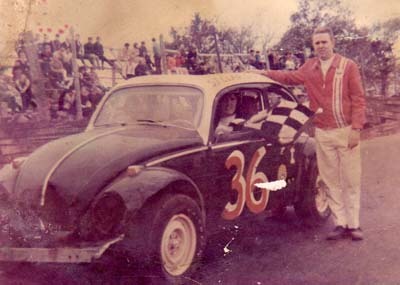 #50 is Don Dunham, Jim Dunham’s brother. We didn’t do a lot of damage and were able to tow the car home. After the roll over we fixed what we could. I painted the fenders white. The next week we went to Cayuga and my car quit on the back straight in about the middle of the track. I got out and watched for a caution, but none came, I wanted to get my car off the track. I kept waving to the starter to stop the race in case my car got hit, cars were zooming by it every lap, but being 100 yards away and all the noise, he couldn’t hear me. Sure enough my car got nailed. The impact was hard enough to crack the engine and bend the sub frame. I was mad and hurt. We always got paid every night after the races and it was usually $5. 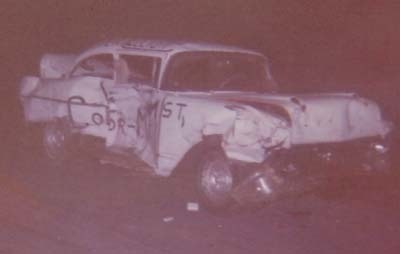 I pleaded my case to Bob Slack that his starter could have saved my car if he had of stopped the race, now I couldn’t race anymore. Bob agreed Book should have stopped the race and asked me if $25 would cover the cost. I was making $1.50 per hour and so it was half a weeks pay. We gladly took the money (equal to a featrue win) and came back the next week with another car. My dad helped a lot to get this V.W. ready to go back racing. We basically stripped the interior and dad welded in the cage. He bent the bars by heating with a torch and using whatever we had to pry bend the uprights. He gusseted every corner. We used the original seat. 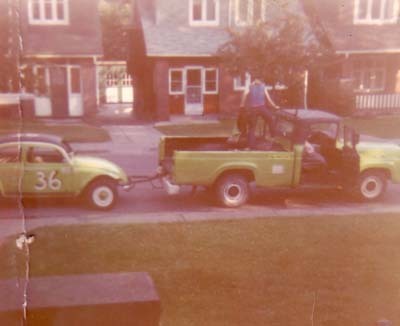 I had a trailer at the time and we used it to get back adn forth from the races. The trailer only lasted half the season, it was so bad. One time Nonie and I were coming back from Cayuga and we stopped into the ice cream restaurant just east of Haggersville. When we were leaving the car came off the trailer and stayed in the parking lot. That was lucky for us that it didn’t come off on highway 6. After that we started using the safer method, the tow bar…safer??.what!!! Near the end of the season we stared going to Acton. Cayuga was closed and it was fun to race there. The back straight was up hill and the front chute was down hill. I won this heat race at Acton as we were pretty excited because we ran good here. We ran well at Acton. Actually we ran good or bad. After winning this heat, our 2nd in 2 weeks we were very confident. This was my first ever Dead Heat and have yet to do it agian. Notice the parking lights on my fenders. They were legal. Later in the Hobby’s I would run imitation headlights and they were not legal. Brian Hill stands between us and I was very happy after this tie victory. That would all go away by the feature…see next picture. 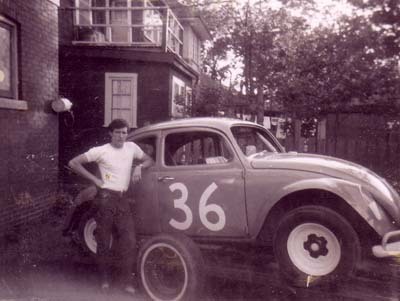 Don Roth helped me quite a bit, he was German like my car, but was a very good mechanic and friend. 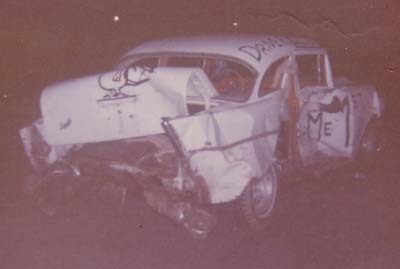 Dad was at every race and had some work to do after this wreck. We came back the next week and rolled over again in the heat. It was the first time someone rolled over 2 races in a row. The feature and then the heat the following week. This would be it for 69′ and we had fun. Time to rebuild. Our garage however was closed from November until April…it was Nonie’s dad’s back yard. In 1970 Nonie I got married on February 21st. 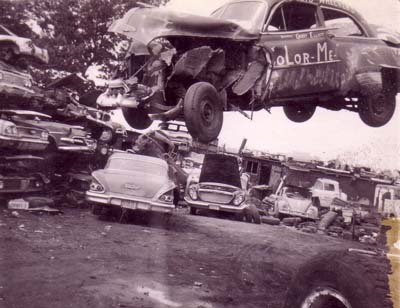 She didn’t want to mess up racing…perfect…we still used Nonie’s dad and mom’s back yard for working on our car. 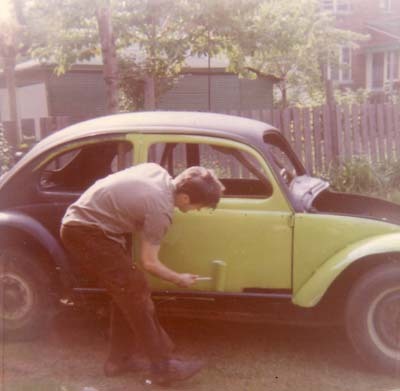 I always painted the car with a roller. We used that on all our demo derby cars and it worked. We build another VW after the roll over’s from the year before. 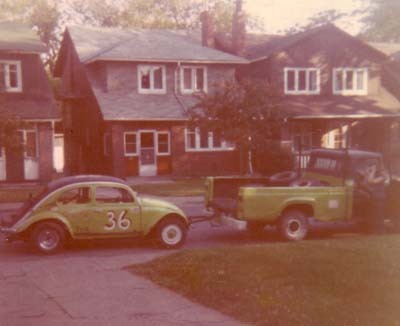 My dad said there were so many Volkswagons in Mr. Bow’s back yard that he was starting to get a German accent…..
Nonies uncle Bill was a clown and agreed to give us $50 to put his name on the car. No problem. That probably coverd the cost of the car and dad’s welding. 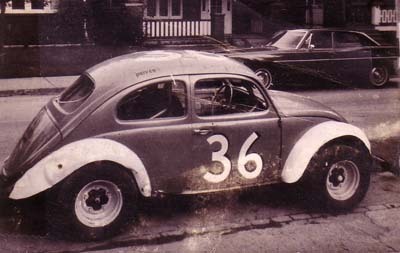 Don Roth lettered my cars the first few years and did an excellent job. We went ot this paint scheme for 70 and 71. 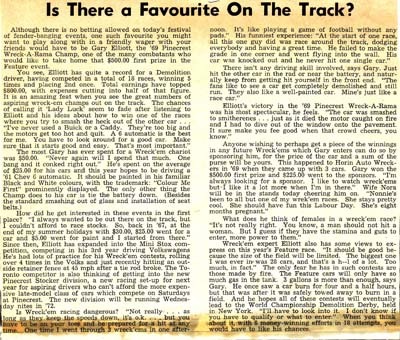 Bob Slack was a great man and no matter what I would always support his track first. 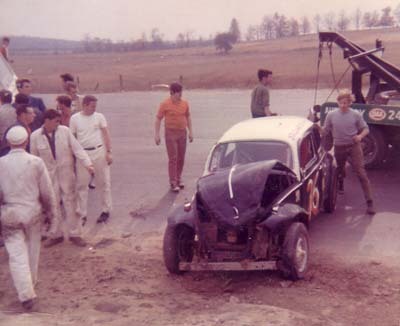 Cayuga had a special where they used part of the mini track, the pit entrances and the pits to host a road course event. I think it was put on by an outside promotion company. Anyway we did have the tires. I was towing with my 66 Dodge Monaco. This picture just about sums up how the day went for most of us. 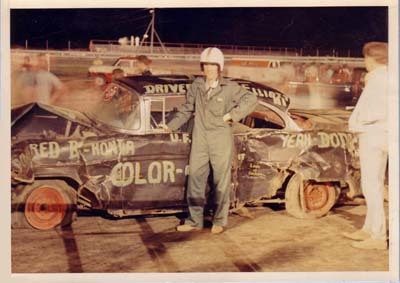 I could hardly drive on the normal track without getting in trouble. This picture was in the newspaper and the caption read something like…”Where Are We Supposed To Go Next? Don Roth and my dad were the main reasons for me making so many shows in 1970. Roger Lewis also was a good friend and helped us every chance he got. I didn’t keep notes for stats like I did with the Hobby’s so I don’t have total nights run or races entered. In the Hobby’s I kept all those stats from day one. 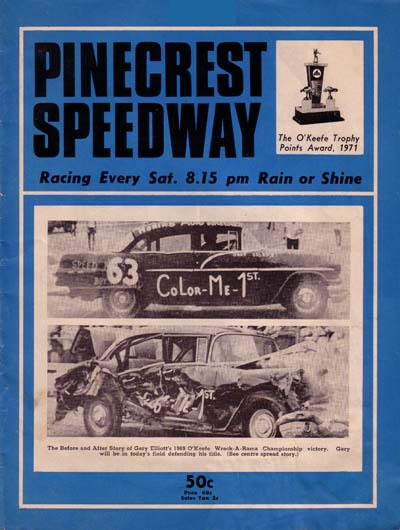 This was the front page picture of the program at Pinecrest Speedway. Chris Bunting #0 was a very tough competitor and so was Doug Suton #47. But you don’t have to be a scientist to see that the Mini had one inch ground clearance and we had about 6 inches. The Mini Cooper was outlawed but the Austin Mini was just as hard to beat. We went to a pick up truck to tow our VW. The paint scheme was the same again only I had Hills Roofing for my main sponsor. That was my uncle this time who would help us out. Nonie packs the truck as we get ready for a trip to Cayuga that would be a night mare. 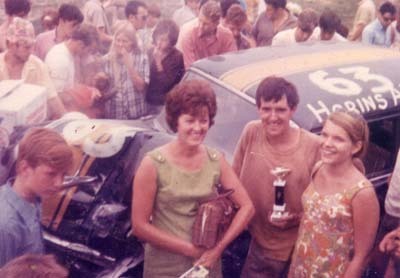 The Incredible Journey It was about 4 PM on a hot Friday night in July 1971, that Gary and Nonie Elliott left Toronto to race their Mini Stock at Cayuga Speedway. 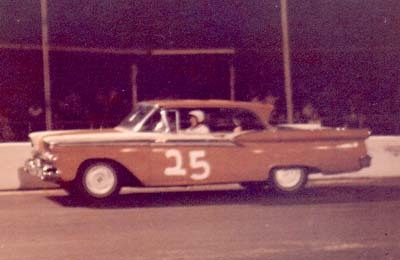 This was Gary’s 3rd year in racing and they finally had their own tow vehicle a 1960 Ford one ton pick up. The Volkswagon was hauled along by tow bar. All was well as they cruised along the QEW in rush hour hoping to get to the track for pre race practice. That wouldn’t happen. Half way up the Skyway Bridge in Burlington things went wrong However, without this incident we don’t have a story. Suddenly the right rear tire blew on the pick up. Stuck in bumper to bumper traffic at 50 mph, the two kept going over the bridge and stopped at the bottom where the toll booths were located. Gary used a pay phone to call local gas stations for a tire. No one had a tire and besides “we are closing, it’s 5:pm” was the response. Frustrated with no help Gary suggested they drive to highway 20 and find a gas station on Centennial Parkway. Gary was surprised, that even with the tire flapping the VW was hanging onto the hitch. Thirty minutes later they finally got off the highway to the safety of much slower city traffic. They would discover very soon there were no gas stations or car dealers opened. They pressed south on Highway 20, thrashing through the gauntlet of home bound drivers and those walking or standing at bus stops. Each red light someone would point out the flat tire smoking on the rear of the pick up. They made it to the bottom of the escarpment. Pulling into an open Sunoco Station on the south west corner, relief set in as the anticipation of getting a tire seemed ineviatble. The tire, by now, was very much tattered. Disappointment set in quickly when the attendant stated “we can’t change tires that big, you’ll have to wait until tomorrow. Besides we don’t carry tires that size”. Okay said Gary, but “how do I get to Cayuga Speedway”, we have to be there in an hour?” “Forget it”!! said the attendant your tire is almost off the rim. So at that point, after driving for 7 miles on the flat tire, Gary had no other option but to do what die hard racers do and that’s continue. What a night mare going up the escarpment. The truck was vibrating, Nonie was bouncing up and down. The truck at times would fish tail out into the passing lane as cars passed on the left side. “If we can make it to the top we’ll have overcome the worst” Gary reasoned. We forgot to mention that Nonie was 51/2 months pregnant. Suddenly during the racket and banging the windshield cracked. No time to stop we got to keep up the momentum. Finally at the top the worst seemed over. That is until the tire started to separate, making a louder noise and shaking the truck even more. Just ahead on the left hand side was, what normal people would have considered as freedom and deliverance. 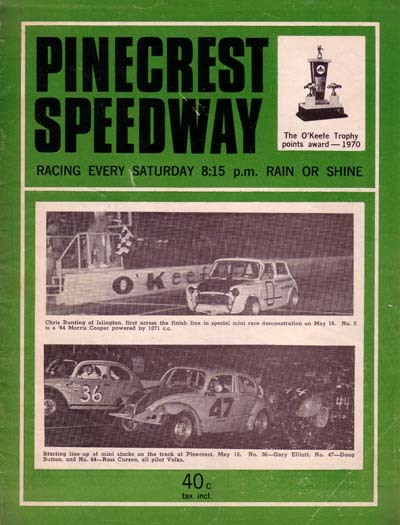 Speedway Park, one of Ontario’s best 1/3 mile dirt tracks. This was a blessing in so many ways. The track ran the Mini Stock division, it was only 8PM and Gary could race and stop this dedicated mayhem. But one thing it wasn’t…it wasn’t Cayuga Speedway. Gary pulled over and called Cayuga to tell them he was at Speedway Park but was heading to Cayuga anyway. That’s where his heart was. It was a paved track and all his buddies were there waiting. The track voice, Wayne Conroy, receiving such a call could only respond, “Gary be careful”! Somewhere on highway 56, between Binbrook and highway 3, the noise and shaking stopped. The tire had totally separated from the rim. Perhaps going forward was the right thing to do, reasoned Gary. After all, with the shaking gone, he could now get up to 30 and 40 mph. It was 9:15 when the two pulled into the town of Cayuga and new problems were occuring. Besides the drivers door panel coming off, there was a howling nose from the rear end that was never there before. Gary again called Cayuga and let them know he was 6 miles, but 20 mintues away. They promised to hold the Mini Stock feature until he arrived, but 10:PM was the deadline. The rear end noise got worse each minute. It was dark and the road lit up from the array of sparks, hidden earlier by the daylight, streaming behind the tilted pick up. Gary pulled over again and checked out the wheel and to his surprise the rim was gone, ground down by the pavement. All that remained was the 8 bolts and the center section of the rim molded around the brake drum. 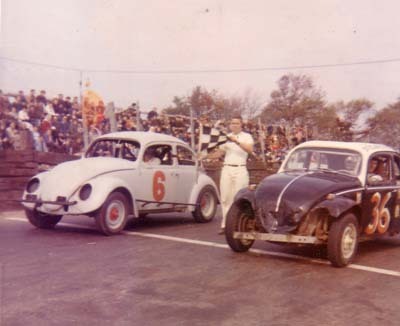 Gary and Nonie pulled into Cayuga just as the Mini Stock feature was lined up on the back straight. 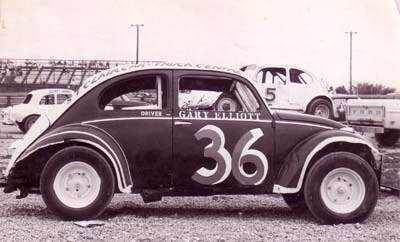 The staff helped him unhook the VW and Gary immediately jumped in and made the race. Victory was achieved for the die-hard couple that night just by starting the race. They camped over at the track . 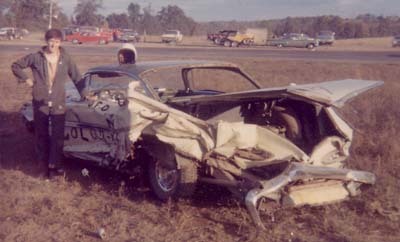 In the morning Bob Slack took them to the local auto wreckers on highway 6 and Gary bought a used tire and rim for $8. The moral of this story? If you’re not sure you want to go racing, don’t hang out with Gary or Nonie. It was a night to remember. We won the heat and then the feature. It’s always exciting to win a heat race, but the feature is totally different. 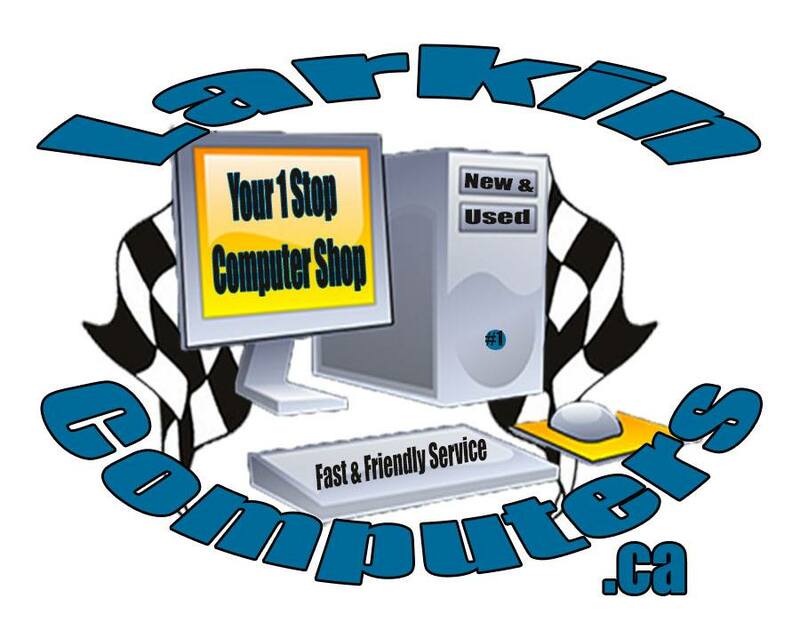 I had led many features over the years, some for only a lap or so and some for more. This night we took both and never stopped talking all the way back to Toronto. At the end of this season we would have our first child. Nonie gave birth to David on October 10th 1971…during this time I always admired and loved the Hobby’s. From the time I use to watched them at the CNE and Flamboro. I tried to buy a membership for the Hobby’s in 68′ but there was no more numbers available. All 125 numbers were taken. Perhaps my greatest memories were how great of a person Bob Slack was. 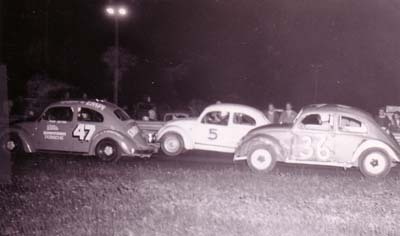 I could have raced a few places the night I had the flat tire, but because of Bob and my racing buddies I wanted to go to Cayuga. The 3 year run in Mini’s was fun and we did it in a back yard. 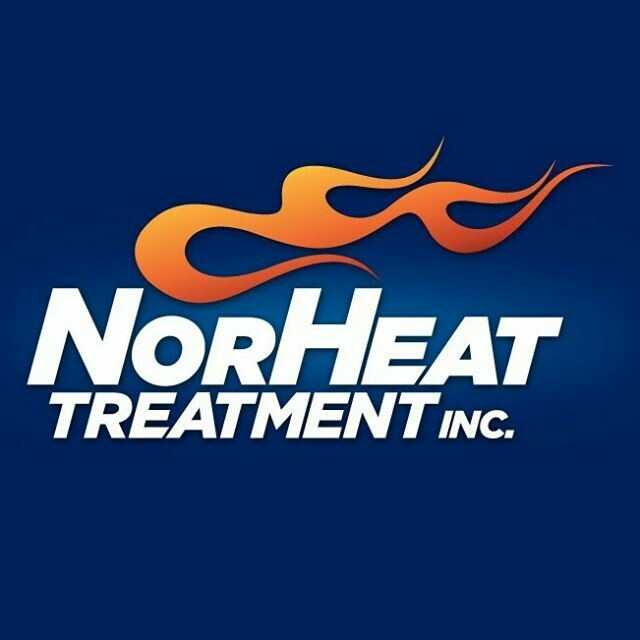 Special thanks to Nonie’s Harry and Dora for allowing me to get started and using their home, but mostly for their daughter Nonie. 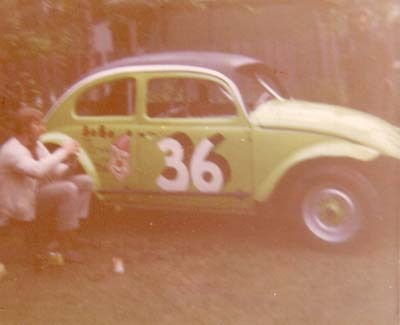 I remember this day, my Uncle George Linklater towed Nonie and I out to Cayuga for this Sunday afternoon show. It was weird for sure. I couldn’t set my car up to turn left on the oval, so we figured, with no set up for this road course, I’d be okay. I can’t tell in this picture if I was leading or stopping for directions. It seems that a few of us were in trouble. Harry Cooper #38 is going one way and me the other. I may have been leading and didn’t know which way to turn on this home made road course. A few of us got twisted and it didn’t take long to be out of contention, I think one lap and we were done, but it was a fun race on a beautiful day. I have no idea where I finished, but somewhere at the back I’m guessing…..actually maybe I won if going the opposite direction was allowed. 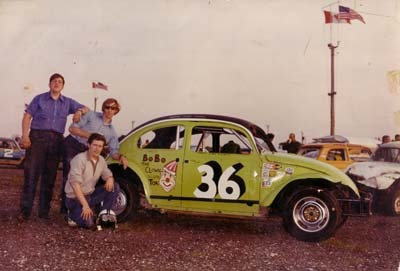 The Mini Stock boys were a great bunch. Larry Anthony, Billy Schlit, Harry Cooper, Art Bird, Bill Held, Jim Dunham, Doug Sutton and Bill Daniels to name a few. If anyone has pictures, please let me know and I will add more to our Mini history. 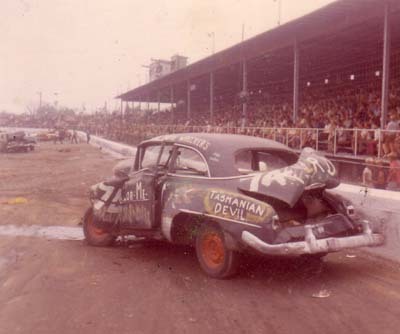 My First Demolition Derby..July 29th 1967…Win!! This was my first time ever on a race track. 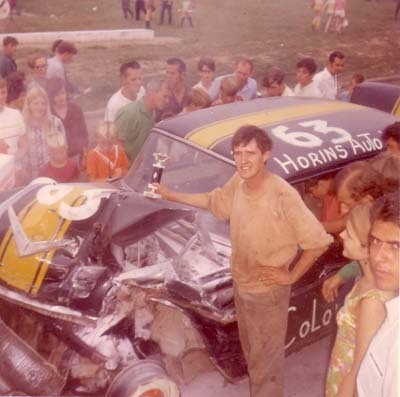 It was at Flamboro Speedway on July 29th 67′. 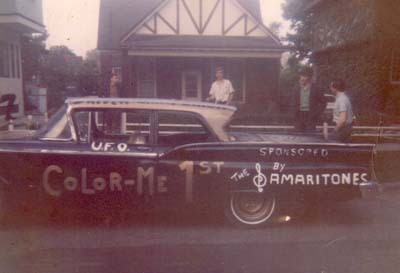 I always painted my cars with the name “Color Me 1st”. On this one, I put powered by Honda on the front fender and yeah Dodge on the back. I guess that’s where it all started for me and the multi representation of car manufacturers. In a few years I will run a 36 Dodge with a Chev motor sponsored by Dixie Ford. There were 34 cars in this race. 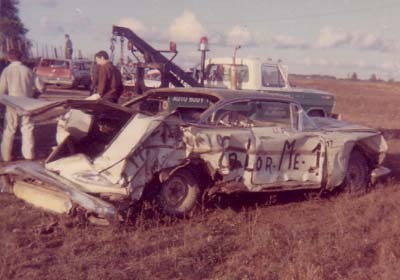 I use to watch Wreck-Em races and always cheered for the car who smashed everything in sight. 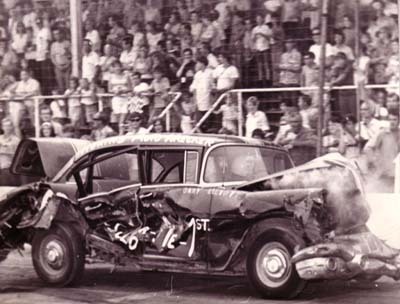 No one liked the driver who hid from the action or faked stalling so others would be eliminated while he played possum. Usually those guys got booed. After the smoke settled there was nothing left of this 55 Chev 2 door hard top…did I say 55 Chev?…It’s true they were very popular at that time, but don’t worry this one was severly rusted, and for the restoring buff there were tons to pick from….4 months after this race I woul ask Nonie out on our first date. (a little family trivia). This Chev let me dwon. It quit and wouldn’t restart. 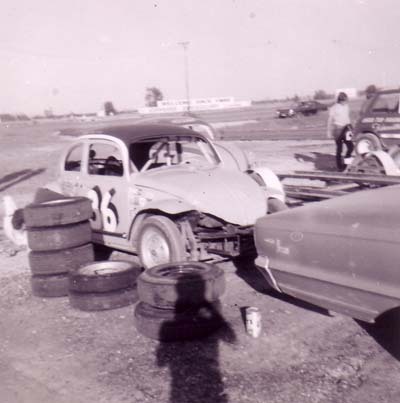 There were always lots of cars in the Flamboro Wreck Em races and unless you had a good running car you were beat. I bashed with many guys who liked the big heavy tanks, Mecurys, Buicks and full size GM’s. They were good for hammering other cars but they overheated quick. 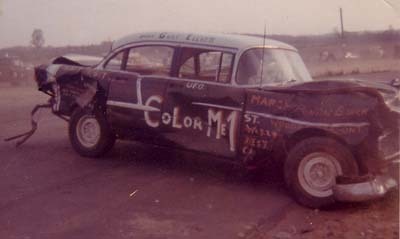 Always Color Me 1st…didn’t always finish first. I tried using Ford for awhile. This Ford was sponsored by teh Samaritones. They were a musucial groukp that went around to nursing homes and hospitals playing for the patients. I was asked to play by the Minister who organized it to try and get kids off the street. My main reason for joining was so I could be with Nonie who also was a member of this group. I asked Nonie to go steady in February of 68 and she said yes. Later on the Samaritones would put $25 into getting this car ready. It didn’t do to well. 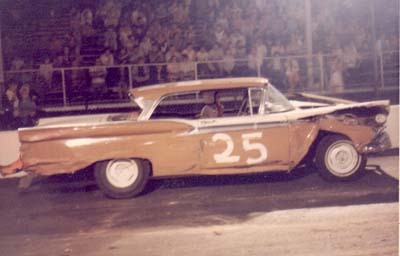 When I got to Acton Speedway, this 59 Chev was for sale for $50. I bought it and won $125 for the Wreck Em race. The reason I took Chevy’s with sixes was because they always started when they got hot. My goal was to destroy the car so bad I coudln’t take it home with me. This Chevy didn’t last either. It was beat up pretty bad. 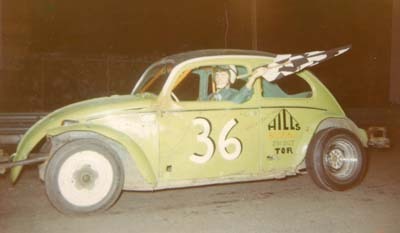 First win with a Ford….This car had no lettering on it. I must not have had time to get it done. 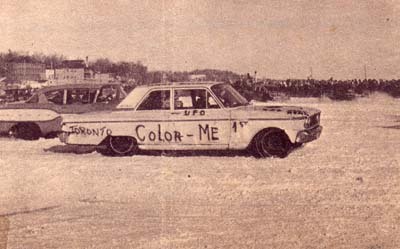 I always put Color Me 1st on th side and UFO on the door.I got warned for speeding in this race and we ended up winning it. Pinecrest had an annual Labour Day wreck em’ race event. It lasted all day with heats and a feature. The grand prize was $500 to win, that would be about 2 months pay. There were 3 ways to get in the feature. 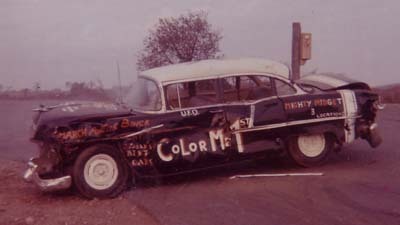 Cars with the most spectacular paint scheme or lettering or appearance were voted on by the fans. The 3 winners were automatically qualified for the feature. Before the heats started they drew 10 names out of a hat. Those names drawn did not have to go in the heat but could save their car for the feature. Over 100 cars showed up. They put compacts in the same heat and big cars in a separate heat. The 6 heat winners qualified for the big race. 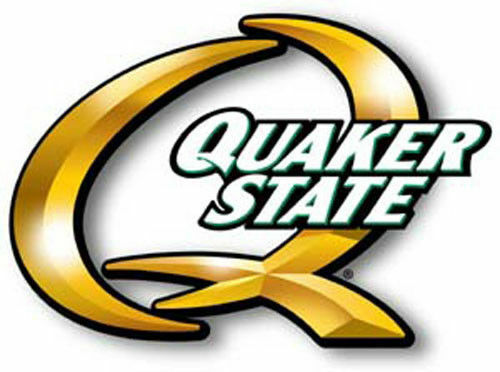 They could use a differnt car because the one they won the heat with wouldn’t be much good. The reason I say that is because if a guy sand bagged the crowd would boo him so that he wouldn’t win even if he was the alst car running. 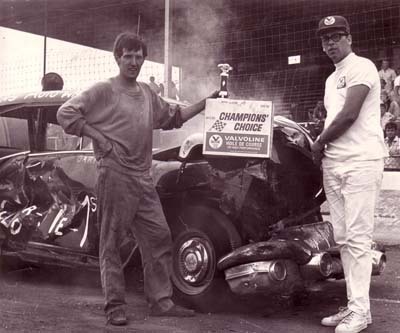 That was the rule on determining the winner, the last car running..the best show for the fans was seeing the last 2 cars being the ones who put on the best show, but a few guys who really put on a show were knocked out near the end…We got a sponsor New York Auto Wreckers who supplied me with 3 cars. The Hillman, a 52 Chev and a 56 Pontiac six cylinder. 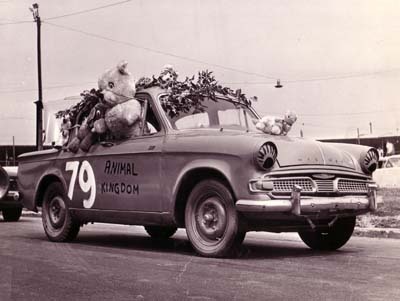 I tried to make sure I was in the feature, so Nonie and I decked this Hillman with stuffed annimals and tree branches and called it “Animal Kingdom”. I would have won in the 3 appearance awards if the winner of the first category went off after he won, but he stayed out. The announcer walked by the cars on parade and held his flag above each car to get the crowds response for the 3 category’s and he won every time. It didn’t seem fair. They changed that system in 1970. After the parade was over we went to the pits for a drivers meeting and the name draw. I did get my name drawn out of the hat so I was guaranteed a start in the feature. I decided to enter the races anyway even though I was qualified. I saved the Pontiac for the Feature. I took some nasty licks in this very rugged car. The steering wheel was jammed and I couldn’t steer or move. I limped out of it. I also entered the Hillman and didn’t fair good with it either, so it’s good I got my name drawn for a chance for the big one. What A Day To Remember…We Win!!! Twenty cars started this wreckem race and at the end it was me and Brian Hill. Brian had a 60 Chev. He was experienced at Demo Derby’s and won his fair share. 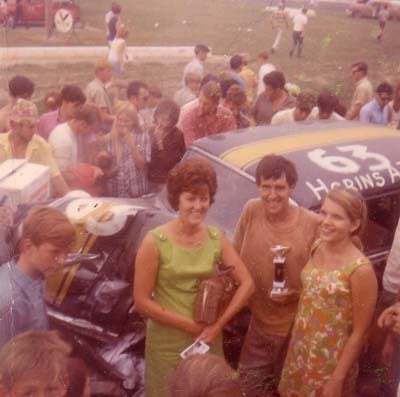 Our cars were destroyed and we kept hammering each other to the delight of the fans. We were crawling around trying to find a way to deliver the fatal blow. He finally hit me so hard that the carb broke off the intake and was just hanging by the linkage. Every bash sent the fans cheering. My car quit and there was silence. I pumped the throttle and it started and a roar went up again as Brian and I faced each other. I was about to hit him again he put his car in gear for another blow, hoping to finish me off. I knew I was in trouble because I had a hard time pushing the throttle, my car was barely idling. Suddenly his car quit and a huge plume of steam came from his rad. That was it the starter waved the checker to me and at the second he did my car burst into flames. I litterally dove out onto the track and the safey crew put out the fire. What a day for us. Perhaps one of my most memorable ever…it would take a long time for my wide eyes and smile to subside. Nonie was very happy, it was a huge amount of money. Nonie was there as well as my mom and dad. What a day for them too. 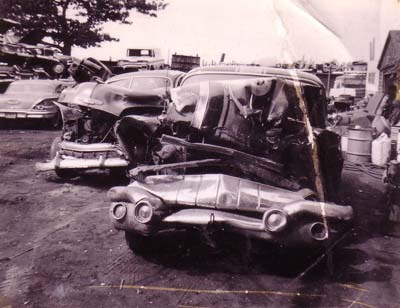 We made a deal that Horin’s Auto Wreckers would give me the cars and if I won I would split the money with them. We took my costs off the top and split the rest. It was a good deal for me and them. They allowed me to work at the yard to strip the cars and get them ready. These cars likely never seen as much exceitement in their lifetime as they did on Labour Day. 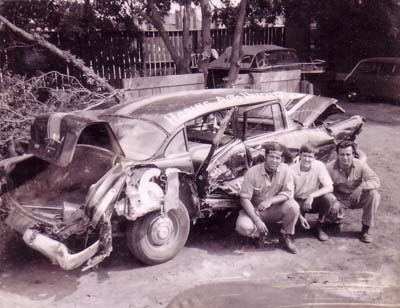 They sort of went out in a blaze, well the 56 Pontiac did for sure. Nonie and i went to Barrie and entered this race plus a demo derby. I was miles out of their league. Every car but one or two had bolts coming through their tires. I had plain wore out snow tires. We had heat races on the ice and naturally I didn’t do well. I will say this dirtis better than ice and snow. The 1971 labour Day Wreck O Rama featured me on this program. I would end up qualifying again in the appearance category but after a few minutes the gas tank was knocked out of my car. I had a great average in demolition derbys. I had won 6 of the races I was in and finsihed 2nd or 3rd in a few others. I had a 30% win ratio, and 50% in the money. I would have loved to take that winning ratio into stock car racing.